Personal correspondence between soldiers and their families often contains the best insights about common experiences, particularly in a border state such as Missouri where guerrilla actions outnumbered traditional battles and where the war touched civilians directly. This letter from Joseph H. Trego, a member of the 5th Regiment Kansas Volunteer Cavalry, to his wife recounts his travel from Fort Scott, Kansas, to the Missouri towns of Springfield, Houston, and Rolla. Trego, a physician and antislavery jayhawker, described harsh terrain in south central Missouri, outbreaks of disease, and a deadly incident between an undisciplined soldier and a family. We are buried up here in a forest where nobody lives and where there is nothing, but mountains, covered every where with trees so thick that we can scarcely see the sun. The teams have gone out twenty five or thirty miles to a valley for corn and will not be back for three days. The hills are awful. There are some things attractive too: the high piles of rock, fine springs of clear water running over clean white sand and gravel and the pines. Trego described pitching his tent and laying out pine boughs to cushion from the ground, declaring himself "fixed up as nice as an old maid." 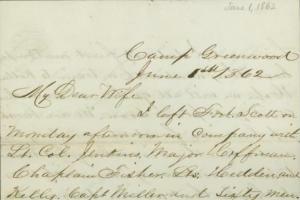 He continued writing the letter on June 6 and expressed some concern about smallpox spreading in the regiment. But by June 6, he had arrived at Rolla, where, "We can get anything we want here, and the whistle of the locomotion sounds quite refreshing as a reminder of civilized times." Their mission in the region was to hunt for rebels who had "been engaged in destroying gov. trains for some time past." Read the correspondence of Joseph H. Trego in our collection, courtesy of the Kansas Historical SocietyOne more incident in the letter described a deadly encounter between an undisciplined soldier and a civilian family, underscoring the perils of extended military conflict and the vices that accompanied it. Trego wrote that Captain Clark, a slaveholder fighting for the Union, was killed when he attempted to force his way into a home that had previously "been occupied by a squad of accommodating girls." These tenants moved out, and a family moved in, only to discover that "those [soldiers] who had been in the habit of visiting the place continued to call." As a result, the military posted a guard in front of the family's home for their protection. When Clark attempted to forcibly enter the home, the guard shot and killed him. Clark was accompanied by an "old nut" with the last name of Rice, who retaliated by firing a revolver at the guard, but missed and hit a young woman from the family who lived there, killing her. The woman's fiancé retaliated and shot Rice in the shoulder, but, according to Trego, "the old sinner is likely to recover." According to the Kansas Memory website, Joseph H. Trego survived the war and died in 1905.